I’m entering the system towards the latter end of the cycle over here, but have managed to accumulate some teaching experience at a few of the levels. So I thought I`d try outlining the basic levels Japanese education system their accompanying ages/grades. I’ve written this in an overly simplistic manner, so please feel free to add commentary and corrections as you might see fit. 保育・幼稚園 (Hoiku/Youchien) Houiku is preschool and has children as young as two in attendance. Youchien is the Kindergarten equivelent, and accomodates children up to 5 years of age. These are generally privately operated, but many of the small towns that haven`t yet been hit by `amalgamation fever` often run their own Hoiku/Youchien centers. 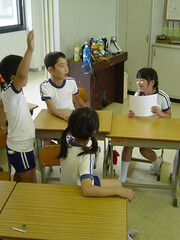 In Japan, class sizes are very large, and most classes are conducted in the lecture/note-taking style. An interesting touch is that clean-up of the school and lunch distribution are taken care of by the students. There are daily `cleaning periods` where classical music is played, and the entire student body takes care of the various clean-up tasks. Including sweeping, mopping, wiping and washing the blackboards, picking weeds, wiping the desks, cleaning up around the pool (many elementary schools have their own pools!!) and cleaning up the Unicycle range. (All the elementary school`s I`ve visited have enough unicycles on a rack for an entire class at a time!!!) At lunch time, all of the students have a `lunch prep uniform` including a white hat, mask, gloves and doctor-style robe/jacket. All of the students walk down to the lunch distribution room with the Teacher, and carry each of the pots, spoons, bins, and milk cases to the classroom in pairs. Each student brings their own cloth table napkin, chopsticks, cup and toothbrush. After the lunch is distributed, extra food is distributed through `paper-rock-scissors` challenges among the classmates, and the end of the lunch period is accomodated by a song for synchronized toothbrushing. 中学校　(Chuugakkou) Chuugakkou is middle school/Junior Highschool and last for 3 years, from 12~15. The types of classes are similar to North American ones, but I was surprised to hear there aren`t any Design and Technology courses. Sports clubs begin at the Chuugakkou level, and are very time intensive. When one joins the Baseball, Kendo, Karate, Volleyball or etc… club, they are expected to practice each day on Monday to Friday after school for 2~4 hours, and also for a half-day on Saturdays. Saturday classes were dismissed with the `stress-reduction` educational movement a few years ago, but Saturday sports practices have filled up that resultant gap. Until 2006, English curriculum begins at the Chuugakkou first year level as a mandatory subject, and continues through Koukou/Highschool. A curious feature of the Japanese system has been the introduction of the ALT (Assistant Language Teacher) through the JET (Japan Exchange and Teaching) Program where Foreign University graduates are recruited to assist English classes at the Jr. and Sr. highschool levels. 大学 (Daigaku) Daigaku is University. University in Japan has three classifications. 専門学校： (Senmon Gakkou) Specialty schools, similar to the Canadian equivement of a Specialty College (As opposed to a University.) There is 短大 (Tandai) which is a 2-year college course. These are for students who wish to enter the workforce quickly, and then the 4-year 大学 (Daigaku) for students looking for honour degrees, or to continue their education. A curious feature is that if a student can pass the incredibly difficult entrance exam to enter their school, graduation is pretty much guaranteed. Graduation essays are not often required, and students will take an absolute minimum of classes in their 3rd and 4th years to conduct 就職活動　（Shuushoku Katsudou） or the Job search. Companies in Japan hire graduates at least a year before their Graduation. Taking a year off after Graduation (to `find` one`s self) is frowned upon, and having gaps in a resume can lead to many difficulties during a job search.